Racing American Quarter Horses have long been the mainstay of our business at Crystal Springs Farm. Please look over the individuals presented in this section, and also watch for our horses on the racetracks and at premier racing stock sales. Quarter Horses mares of premier racing bloodlines form the foundation of our successful breeding program. Crystal Springs Farm has bred or co-bred, owns or co-owns, top Quarter Horses now running and/or in race training. Watch for these stars on today's racetracks! Each year, Crystal Springs Farm offers Quarter Horse yearlings for sale which carry some of the very best racing bloodlines to be found anywhere. Please call us for more information: (859) 983-2545. Quarter Horse foals born each spring at Crystal Springs Farm are among the highest quality individuals in the industry. If interested in these youngsters, please call us for more information: (859) 983-2545. To see some of our foals both current and years past, please check out our Facebook page, https://www.facebook.com/crystalspringsfarmnm. Great day at Zia Park on Sunday, 10/30/16. Sippin (Swissle Stick o/o Samba Queen x Giant's Causeway)wins the Lassie to stay undefeated in 5 starts and Another Brother (Attila's Storm o/o Hang Glide x Dome) wins the Juvenile Championship. Thanks to team Fincher, riders Tracy Hebert and Alfredo Juarez! Over the years, R.D. Hubbard and partners have had ties to more than 100 stakes winners – some of which were born at or are affiliated with Crystal Springs Farm. Just a few of these great horses are listed here. Brenda Beautiful - QH SI 110 (f. by Feature Mr Jess-QH). 4 wins at 2 and 3, placed at 4, 2010 in QH races, $337,176, AQHA Racing Champion Two-year-old Filly, Register of Merit, Southwest Juvenile Championship-G1-ntr, 440 yards in 0:20.966, Hobbs America Futurity-G2, 3rd Hobbs America Derby-G3, KOFX-FM H., Finalist in All American Derby-G1, Ruidoso Derby-G1. Last raced in 2010. Denim N Diamonds – QH SI 105, by Timeto Thinkrich-QH. 25 wins in 35 starts, 2 to 5 in QH races, $731,118, AQHA Racing Champion Aged Horse, AQHA Racing Champion Aged Mare twice, Superior Race Horse, Register of Merit, Champion of Champions, Vessels Maturity, Los Alamitos Invitational Championship, Go Man Go H., Horsemen's QHRA Championship, Peninsula Championship, Sunland Park Fall Derby, Shue Fly H., etc. Last raced in 1982. Favorite Cartel - Second stakes victory and first graded stakes win at Los Alamitos the Grade 2 $72,630 Bank of America California Championship. Won 2010 Paul Ford Handicap. A five-time Grade 1 qualifier. At stud. Feature Mr Bojangles - Champion 2-year-old colt and champion aged stallion. Won 2013 Championship at Sunland. Named Sunland Park's Quarter Horse of Meet 2013/2013. Currently standing at the Lazy E Ranch. Ketel Won - QH SI 107 (c. by Stoli-QH). In QH races: At 2, Register of Merit (2005), unplaced in 1 start; at 3, two wins, twice 2nd, once 3rd (Hobbs America Derby), finalist in All American Derby-G1, Rainbow Quarter Horse Derby-G1; at 4, AQHA Racing Champion Aged Horse (2007), AQHA Racing Champion Aged Stallion (2007), 4 wins (The Championship at Sunland Park-G1, Zia Park Championship-G1, Higheasterjet H.-G3, All American Gold Cup-G3), once 2nd (Mr. Jet Moore S.-G3), once 3rd (Los Alamitos Invitational Championship-G1) in 6 starts; at 5, AQHA Racing Champion Aged Stallion (2008), Superior Race Horse (2008), 2 wins (Zia Park Championship-G1, All American Gold Cup-G3), twice 2nd (The Championship At Sunland Park-G1, Lovington H.-G2), finalist in Refrigerator H.-G1. Totals: 8 wins (6), 5 times 2nd (3), twice 3rd (2). Earned $651,740. Last raced in 2008. Make Mine Cash - SI-110 Stakes winner of 7 races. Superior Race Horse, ROM $1,142,428 (1st Faberge Special Effort Fut., All American Derby G1, Miss Peninsula Hdcp G3, 2nd Mid-Summer Inv Hdcp, 3rd Lassie Hdcp G2, Peninsula Championship G1, etc.) AAAT and AAA producer. 8 starters, 8 winners, 1 World Champion. Noconi - QH SI 105 (g. by Mr Jess Perry-QH). 9 wins, 3 to 5, 2010 in QH races, $987,163, aQHA Racing Champion 3-year-old Gelding, Superior Race Horse, Register of Merit, All American Derby-G1, Hobbs America Derby-G2, Lovington H.-G2 twice, All American Gold Cup-G2, Higheasterjet H.-G3, etc. Last raced in 2010. Planet Holland – QH SI 127, $798,885. Rainbow Futurity (G1) winner. Retired. Stoli - QH SI 99 (c. by First Down Dash-QH). In QH races: At 2, Register of Merit (2000), 5 wins (West Texas Futurity-G1), once 2nd, once 3rd in 9 starts; at 3, AQHA Racing Champion Three-year-old (2001), AQHA Racing Champion Three-year-old Colt (2001), Superior Race Horse (2001), 5 wins (All American Derby-G1, Z Wayne Griffin Directors S.-G3, Pcqhra S.), twice 3rd (Los Alamitos Invitational Championship-G1), finalist in Champion Of Champions S.-G1, The Championship At Sunland Park-G1, Ruidoso Derby-G2 in 10 starts. Totals: 10 wins (4), once 2nd, 3 times 3rd (1) in 19 starts. Earned $332,237. Last raced in 2001. Super Sound Charge – QH SI 109, Champion and sire of champions. The Down Side – QH SI 107, Champion of Champions winner, sire of winners & stakes winners, 105 ROMs. The Signature - SI 108. Stakes winner of 11 races, $333,473. Sire of 514 ROM, 47 stakes winners, 7 champions, earning $11,063,241, including Heza Fast Man, si 111, $801,356; Sign of Lanty, si 108, $545,542; Sig Hanson, si 102, $433,193; Rare Form, si 120, $278,191. 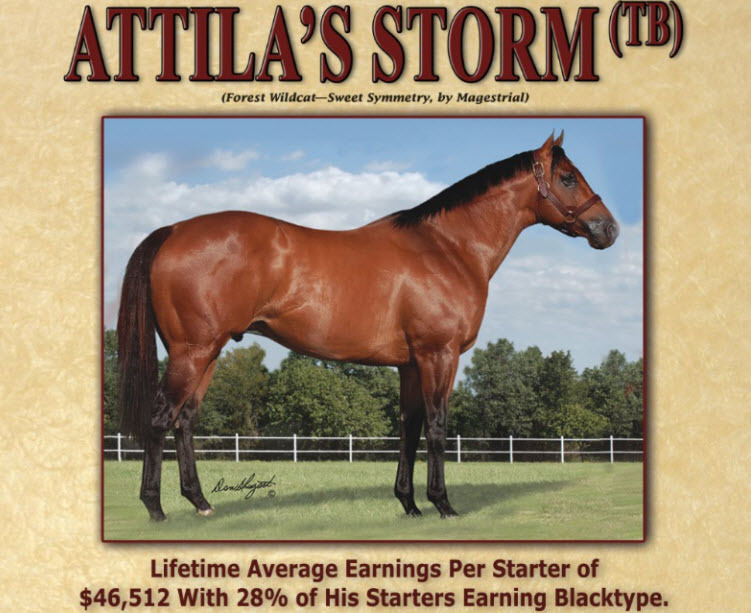 Sire of the dams of 29 stakes winners. High quality Thoroughbred racehorses have long been a big part of our business at Crystal Springs Farm. Please look over the individuals presented in this section, and also watch for our horses on the racetracks and at premier racing stock sales. Thoroughbred mares with premier racing bloodlines form the foundation of our successful breeding program. Tom Goncharoff with Samba Queen, dam of champion racer Sippin. Shaun Hubbard with Hang Glide, dam of champion racer Another Brother. Crystal Springs Farm has bred or co-bred, owns or co-owns, top Thoroughbreds now running and/or in race training. Watch for these stars on today's racetracks! Each year, Crystal Springs Farm offers Thoroughbred yearlings for sale which carry some of the very best racing bloodlines to be found anywhere. Please call us for more information: (859) 983-2545. Thoroughbred foals born each spring at Crystal Springs Farm are among the highest quality individuals in the industry. If interested in these youngsters, please call us for more information: (859) 983-2545. To see some of our foals both current and years past, please check out our Facebook page, https://www.facebook.com/crystalspringsfarmnm.